Top King Shin Guards (Comprised of Pro, Superstar, Snake, and Camouflage lines). 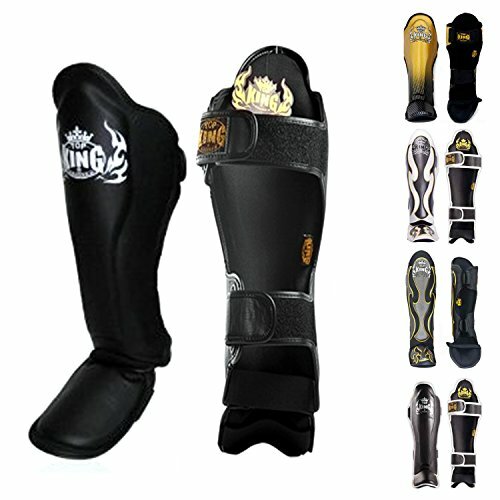 Top King is one of the most widely known and recognized brands in Muay Thai and combat sports worldwide. Based in Thailand, they’ve built their reputation based on their quality gloves, shin guards, pads, and clothing which have the perfect combination of flash and protection, giving them an individual and unique style. Up for review here are Top King’s Genuine Leather Shin Guards. 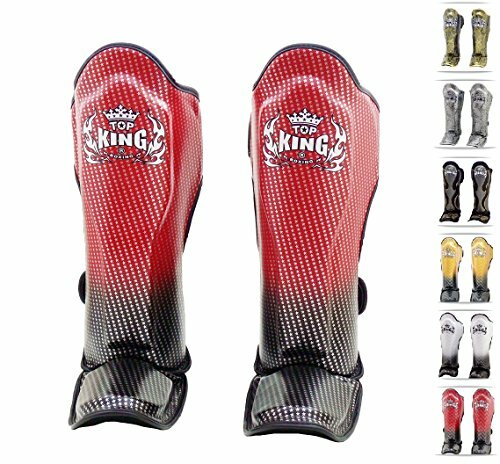 The “Super Star”, “Pro”, “Snake”, and “Camouflage” lines of Top King’s Shin Guards all share the same exact basic design, but each comes in a variety of unique colors and designs. The particular model pictured here are their “Super Star” line. Disclaimer: Top King’s “Empower Creativity” line of shin guards feature their own “flame” padding design on the shin/foot sections rather than the raised shin/foot ridge design which all of the above lines share in common. Therefore, the “Empower Creativity” line will not be reviewed here. Hand made in Thailand and constructed with genuine leather, these shin guards have had particular attention paid to the areas around the lower leg muscles near the ankle and under the knee caps to offer more protection than their competitors. Because of their design, this shin guard is as close as it gets to having 360 degree protection around your leg with little to no movement. The upper part of the guard extends slightly halfway under the kneecap in order to protect both the knee cap and upper region of the shinbone while checking hard kicks. The outside of the guard consists of a thick layer of raised vertical padding running straight down the shin so when either throwing or checking hard leg kicks, the wearer takes minimal to no damage. The lower portion of the shin guard and the pad covering the upper foot region effectively shields the instep and ankle area against unnecessary damage with a thick layer of padding that makes it hard for opponent’s kicks to get through. The pad covering the foot extends just up to the toes and has equally as much padding as the rest of the shin guard to prevent unnecessary damage in the event of a missed kick or hit to the foot. The area just above the instep is also covered with a piece of padding and leather that doubles as both protection and a joint to connect the upper part of the guard with the foot region. Both the instep and foot protection aspects are often overlooked in other shin guard designs and are a nice addition that makes the actual shin guard feel like it’s a part of your leg rather than just something you’re wearing. The inside of the shin guard is a thick, but lightweight padding formed in the shape of a shin keeps the leg locked in place along with the heavy duty straps. These shin guards use a hook and loop closure to ensure a secure fit around the calf area and ankle area of the leg. Because the two straps and the actual shin guard part itself are both made from a single piece of leather, there is no need to worry about them being torn off or falling apart anytime soon due to shoddy construction or them being separately stitched on. The leather straps also feel soft on your legs and don’t bite into them. The velcro on the backside of the straps is sturdy and the stitching of the leather around it leaves no loose or sharp edges to come apart or cut sparring partners during training. There is also one more elastic strap that goes around the ankle and another that goes around the bottom of the foot to keep everything in place. That brings the total number of straps for the leg to three and one for the foot. Although elastic, the stitching is sturdy enough to where they won’t be falling off anytime soon and because they are tight, they help keep the shin guard glued to both the ankle and foot. While Top King are generally known for their flashy gear, their shin guards provide the buyer with a multitude of different color options; ranging from the “Superstar” shin guards reviewed here with a two toned fading color scheme of vertical angled stars to their “Pro” model which are the same exact shin guards, but feature a basic solid color for minimalists. There is also an option for different colors of trim for the “Pro” model. The “Snake” model of the same guard comes in several different snakeskin prints while the “Camouflage” model features different colors of camo print. All models feature Top King’s signature trademark flame logo on the upper part of the guard. Top King have definitely provided you with many options to choose from. Depending on which design you choose, your sizing, and the site you order from, the shin guards range anywhere from $57.99 up to $90.00. Thai websites are generally on the cheaper side, but expect to pay anywhere from $20-30.00 for shipping as these come straight from Thailand. The cost is still worth it when you consider the durability, comfort, and longevity of these shin guards which are sure to take a beating for months and years to come. If there is any downside to these shin guards is that they can at times feel thick and bulky because of the padding, but this is the tradeoff you make for the added protection. These would also not be the ideal shin guards for heavy MMA groundwork. This is not to say these shin guards can’t be used while grappling as they very well can and you’d probably be hard pressed to find another shin guard which doesn’t move around your leg during grappling, especially compared to “slip on shin” designs and other low quality hook/loop closure brands. But, their size and thickness around the shin will make guard work off of your back a little more difficult. Because these were designed for stand up striking purposes, they are best used for that in addition to light grappling and scrambling applications. Despite this, you’ll be hard pressed to find a better overall shin guard on the market today for Muay Thai, kickboxing, or MMA sparring and training sessions than in Top King’s line of genuine leather shin guards. With their light weight, raised shin and foot ridge, thick padding, wrap around design, instep protection, genuine leather construction, and heavy duty hook/loop straps, they’re sure to keep everything locked in place and protected during the hardest of sparring sessions. 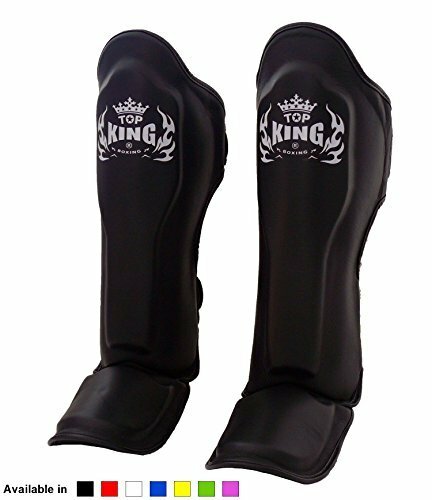 Jhullian purchased this pair of Top King Shin Guards himself for the full price. This did not influence the outcome of this review. Comment from discussion Top King Shin Guards Review by Jhullian – MMA Gear Addict.